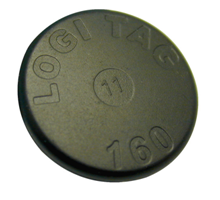 The Logi Tag comes in a compact form factors which can easily be embedded in clothing and textile. They are durable and care resistant to extreme temperature, chemicals, fluids, industrial detergents and high pressure. The Logi Tag RFID transponders enable uniform management companies to more accurately control lifecycles, increasing garment productivity by 20%, reducing throughput by15%, and decreasing stock requirements per customer an average of 12%. As part of a commercial laundry system, these tags ensure accurate item counts and documentation, enabling automatic billing and real-time inventory control. Medical facilities can better ensure patient and staff safety, through improved infection control processes. On disposable assets, transponders enable faster, more accurate surgical counts. Organizations can effectively track reusable assets and verify cleaning and sterilization procedures. Compliant with standard RFID readers and modules, the discs are easily sewn into the hem or seam of a garment, uniform, napkin, tablecloth or runner. They may also be affixed to custodial supplies, such as mats, mops, washrags and towels.